Redrawn from Levine HJ. Rest heart rate and life expectancy. 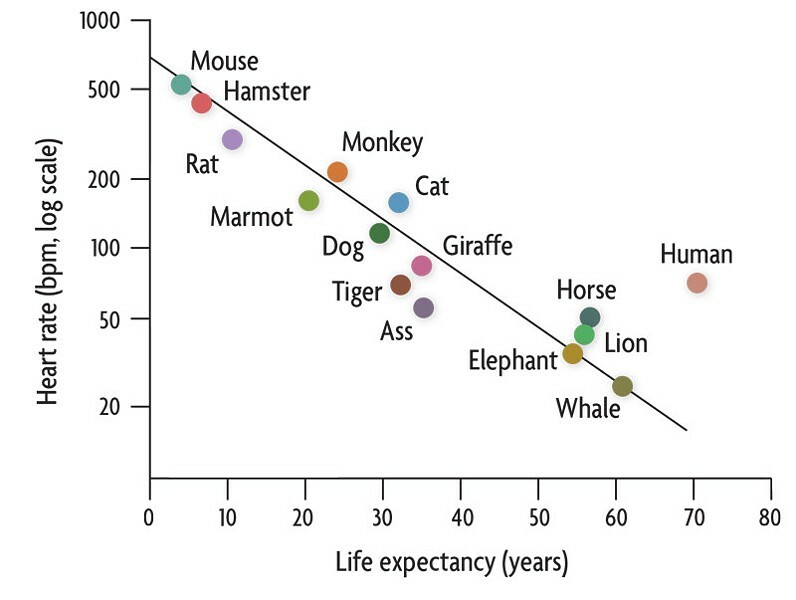 J Am Coll Cardiol 1997 Humans are outliers relative to other mammals when comparing lifespan to heartbeat. Like Achilles, who was given the choice of living a short, glorious life or a long and dull one, animals with high-metabolisms/fast heartbeats (such as shrews and mice) have a brief but furious time in the sun, while comparatively plodding horses and elephants enjoy long lives. Take the American pygmy shrew, North America's smallest mammal. It's about the size of the top segment of your thumb, with a tail added. Relative to larger mammals, this tiny critter's metabolism is a blur of activity. In terms of pulse rate, for instance, compare the shrew's 1,400 heartbeats per minute to the human's 60 and the elephant's 28. Some 80 years ago, biologists stumbled on the empirical "quarter power scaling rule," which states that a mammal's heartbeat is proportional to the creature's mass taken to the minus one-quarter power (m-1/4). The rule says that a cat, for instance, weighing roughly 100 times more than a mouse, has a pulse rate 100-1/4 (about one third) that of a mouse; it's actually 150 versus 500 beats per minute (bpm). Note that we're the exception. If humans followed the "one billion heartbeat" rule, we'd be pushing up the daisies around age 32. (Contrary to popular myth, the maximum lifespan of humans hasn't increased that much over the centuries — used to be, plenty of people lived to age 70 if they were able to avoid disease and violence.) What's so special about us that we manage to avoid the billion-heartbeat hypothesis, and live three times as long as we "should?" Probably because we have long periods of adolescence compared with other creatures. Paleontologist Stephen Jay Gould attributed this happy state of affairs to our "neotenic" evolution, whereby as adults we have retained the juvenile features of our ancestors. We thus have much longer gestation and childhood periods than comparably-sized mammals. If members of other species could reason, they might well envy our seemingly eternal youth as we live out our long adolescences. And anyway, life is more than numbers. Louis MacNeice, in his long poem "Autumn Journal," maintained that the rest of his life (following an affair of the heart) "will not be only/ A drag from numbered stone to numbered stone/ But a ladder of angels, river turning tidal." Barry Evans (barryevans9@yahoo.com) recently celebrated his 2.3 billionth heartbeat.